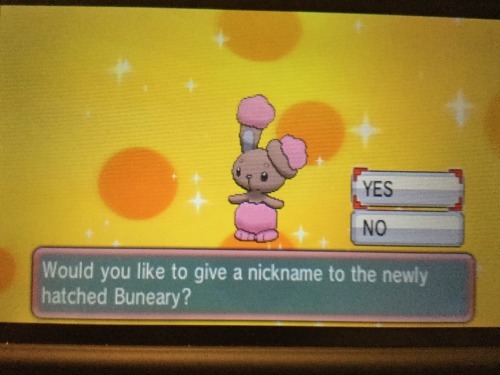 i got a shiny buneary after 114 eggs! I never thought of breeding for shinies! I want one!! So cute! yeah, if you breed two different pokemon from a different part of the world the chances of it being shiny are increased. it's called the Masuda Method. i used an english ditto and japanese buneary. if you decide to breed for a shiny i highly recommend doing that and also getting a flame body pokemon. I ran into one of those in my Platinum version in the forest. I was scared of losing it because the girl who travels with you has a chansey who's pretty tough. I thought for sure she'd attack it. Thank goodness she left it alone and I managed to catch her. I haven't evolved her and I don't plan to. The flame body ability is definitely an egg breeder's best friend. thanks guys, i knew about flame body (and magma armour!) but didnt know about 'foreign' egg breeding! i have a few pokemon from gts trades in my pokemon bank...time to start some serious breeding i think! oh yay, more excuses not to work on my research or essays! he looked... rolled his eyes...and said... yes mum, its a shiny...but i wouldn't get too excited, its a nosepass! If you're going to breed for shinies, it really helps to put some effort into completing your pokedex first (not including event legendaries). That way you can get the Oval Charm for quicker egg production, and the Shiny Charm for higher chance of shinies. It makes a huge difference, especially when also using Masuda Method! How do you get a shiny charm in ORAS? I've asked all over youtube and not a single person has replied back with the answer. Deoxys may be needed now, as it's catchable in-game. Once you have all pokemon registered, you speak to the Professor (in person, not through the PC) and show him your national dex. You should get the shiny charm! I don't have a living dex but I'd be happy to assist you! I have almost all legends so if you need any of them I have em, and maybe some of the other pokemon you need. Let me know ok? That is a big help. I knew you had to do certain things to unlock the starters. I have mostly the hoen region set except for a few I need to evolve and maybe one or two more to run into. I have over 500 pokemon registered in the dex in my Alpha Sapphire which I'm proud of, but I still have another 200 something to go. I have no idea how to find Hitmonlee or chan. The problem is not having internet at home and only having it when I visit my friend's house. If I can set up my pokemon bank account then I can transfer the pokemon I have in yellow over to my AS version. As for the mythical pokemon I'm slowly getting those too thanks to the releases. I have at least one of each so far. That would be so awesome. I've got all of them I believe except for the three birds. Because X and Y had to make it soooo hard to get them. It was annoying enough with the dogs in G/HG and S/SS but at least with them you could still throw a poke ball. Aside from them and the hitmon pokemon the only other pokemon that I'm not sure how to get is Probopass. I'm not a fan of that pokemon, but I don't know how to evolve him in these games. In P/D/PL you have to train it in a certain place. For Probopass I believe you need to level it up in the Electric cave in XY, the place where you find Klink. In ORAS, you have to level it up in New Mauville. For the Hitmon pokemon you have to evolve Tyrogue. But, if you have any sort of internet connection I do own all 3 so I can trade them to you. Same applies for the Kanto birds. If you have Tyrogue or Hitmontop, you can breed those and evolve them to get the other Hitmons. It's annoying though since the Attack and Defense stats have to be right, so it's best to do some Super Training to make sure the stats are as you want them to be. The pokemon from Yellow can't be transfered yet; it'll be possible to transfer them to Sun/Moon, but for now they're stuck on Yellow. for those of you in europe & australia, the manaphy event for june is now live! to receive the mythical pokemon manaphy, open your game and go to mystery gift > receive gift > get via internet. you'll have until june 24 to receive it, and for those of us in north america, the event will go live later this evening! Thank you and dragontamer44722 both. I've been so busy with everything that I haven't really been able to sit down and learn about the new twists and rules for these games, even if they're a few years old. I've only gotten my 2DS last October. So, it seems I was misinformed when it came to transferring my team from Yellow into ORAS. That bites, but I don't have to wait long for Sun and Moon so I can wait for that. I still need to get my Pokemon bank set up. I'll just wait to start it up until then, if that's the case. Excellent. I'll try to catch a Nosepass and a Magnamite and train them that way then. That's one of my biggest challenges out of the way. @dragontamer44722 - Tomorrow I'll be at my friends house around 1:00 pm - 7:00 pm cave time if you're on around then than I can do the trade then. I have a few doubles of some of the mythical legends if you'd like any of those in return? Hey, for anyone who got Yellow version, did anyone notice the cool mini game at the surfer's house south of Fushia? I don't remember that in the original, but I'm loving it! Also, I can't believe its harder to get a Scyther from the Safari Zone than a chansey. I've caught two of those and all three Scyther I've run into flee. (also, why do poke balls miss in that game? I forgot that it could happen.) Oh well, At least I caught that Dragonair. @catmosphere - I know. I'm getting it tomorrow. I can't wait! That also means a new card collection box for the trading cards. I love the pins that have come with them so far. yesss!! i love the collector's boxes! i've been desperately trying to get them all for the pins, but so far i only have mew and darkrai. i'm hoping to grab celebi and jirachi before they get harder to find, there's only a handful of places that still have them in stock! I was lucky to grab one of each. My local Walmart sells out of them quick. I saw a single Jirachi box the other day, but it was gone when I went back to try and get it. :/ I love the special packs that come with it, especially the radiant collection because of the artwork. The artwork for the eeveelutions especially. That fullart Flareon is adorable sitting in between Jolteon and Vaporeon. I'm trying to get that card and an EX mega blastiose. I already have Mega Venusaur and Mega Charizard which everyone's been saying it's the most valuable card in the set. It'd also be nice to grab that fullart mega gardivour which has both normal and shiny versions on the card. I'm a sucker for shiny pokemon. ; I only have five cards with shinies. The promo Legendary dogs, the promo shiny Gyarados and the Shiny Dialga from an earlier set. I'm looking forward to getting Keldeo the most. I didn't really care too much for the movie, but Keldeo himself is awesome, especially since his English VA is the same guy who voiced Edward Elric from Fullmetal Alchemist. That was such an amazing anime. So far out of the event pokemon I've gotten Mew has been the most reliable one on my team. The others are awesome, but Mew hasn't lost a battle yet and she's been so much fun to play with in pokemon amie. I've got her friendship level maxed out. I've heard people say that it's not worth maxing out their hearts unless trying to get a Sylveon, but I don't think they've realized all the benefits that you get. Extra exp, they can heal themselves from status effects and land crits more often. And once the battle ends you can pat them on the head before the screen darkens out which I discovered by accident and it was pretty cool. @dragontamer44722 - Will do. I appreciate the help big time. but i have to agree, keldeo's movie didn't impress me too much, either, but i do love him! i'm still trying to catch the musketeer trio in omega ruby, too - they're the only legends i haven't gotten besides the ones that are version exclusives. maybe i'll make it a point to catch them before the event, that way i'll be able to complete the set when keldeo's released! to be honest though, the only event pokemon i've actually picked up so far is mew on my omega ruby save, lol. ;; i've been soft resetting them for nature and ivs, so i still have all of the other events sitting in queue on both x and or, waiting for me to get them from the delivery girl. 💔 but you're absolutely right, it's so worth it to max out hearts; all the pokemon in my party are maxed out because the benefits are fantastic!! even for the 'mons i use for competitive play, i always max them out because the exp bonus comes in so handy for levelling, especially when you combine that with blissey base training. it's probably one of my favorite features, and i really hope amie makes a reappearance in sun & moon. from what I've learned with the cards is you either grab a really good box or a dud. All except one of mine have been awesome. I grabbed a second darkrai box and it didn't have anything special in it. I've gotten a few fullart pikachu, a Sylveon ex, a golem ex and that's pretty much it aside from the Venusaur and charizard. I'd love to also get the Jolteon and Leafeon ex. The artwork is really nice. Oh yeah, the legendary treasurs was an amazing set! Those secret rares were really cool. I about flipped out when I pulled the SR Zeckrom from a pack last Christmas. I loved the RC collection from that one. My favorite was the dark type cat pokemon from the black and white games. I forget its name, but tyeh card and desgin was just gorgeous. Yeah, finding them on the right day of the week is a bit annoying but they're pretty good pokemon once you get them. I hope amie comes back too, though I think it'd have to if people want to get a Sylveon. i've been meaning to reply to this, so sorry about that!! but today i finally found a retailer that carried the manaphy box, and my best pull was a rc flareon ex! the manaphy promo card is also beautiful, it has little phiones floating in the background and it's so cute. i also ordered my celebi box on amazon earlier this week, it hasn't shipped yet but i rlly hope this one won't be a dud - you're definitely right about them either being a hit or miss! but if they left amie out of the new games, i can see them coming up with an alternative method of raising affection with puffs or something similar. you can bet i'd be bummed about it though! !